This sturdy aluminum design is moderate in all aspects to provide an unmatched combination of durability, livability, comfort and speed. The raised pilothouse extends forward over the galley and lower dinette to form a spacious atrium. The galley is large and has adequate storage for both refrigerated and dry stores. The saloon is fully contained in the pilothouse so all entertaining is done with the benefit of the view. There are two spacious staterooms plus a smaller cabin for children or crew. 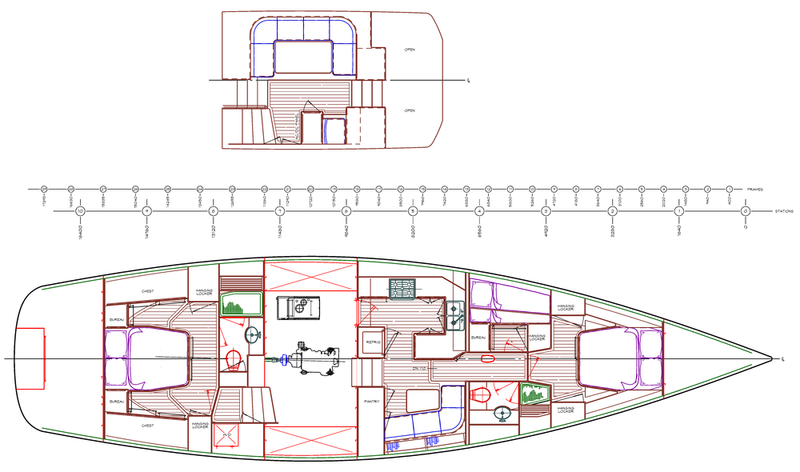 Under the saloon is an engine room with adequate space to maintain all equipment. The deck is flush forward of the pilothouse. The cockpit is divided into a working portion aft with easy access to sail control lines and a part directly forward for relaxing and entertaining. Three sided access to the lazarette is gained from the large transom boarding platform.